One spectacular dish from my mystery recipe collection (read: recipes of unknown origins I had written down many years ago and lost in the piles of cookbooks and clippings, only to be rediscovered and begging for some sweet attention!). Place potatoes in a medium sized pan and add enough cold water to cover. Bring to simmer over medium heat for about 25-20 minutes, until the potatoes are tender, but not mushy. Transfer potatoes to a large bowl. Cube potatoes and eggs, about 1/4 inch in size, toss in tuna, capers, chopped parsley and reserved tuna oil, season with salt and pepper. Mix all ingredients until well blended and set aside. Preheat the oven to 375 degree F and line a baking sheet with parchment paper. Using sharp knife, cut puff pastry sheet into 5" x 5" squares. 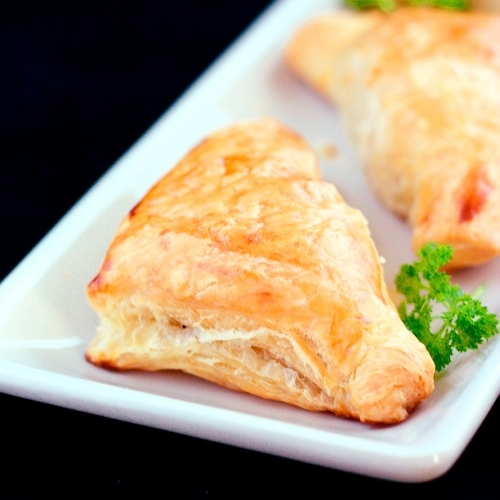 Take a heaping tablespoon of tuna filling and place it in the center of the puff pastry, brush the edges with a little bit of water. Fold pastry to form a triangle, and transfer to lined baking sheet. Continue the process with the remaining ingredients. You should be able to get somewhere between 18-20 turnovers. Brush the top of the turnovers with the prepared egg wash. Bake in the oven for about 20 minutes, or until they turn golden brown. Remove from the oven and cool down on the rack. Serve warm. These sound REALLY good! We love potatoes and tuna in our house. I have a feeling these would be a big hit. Genius! These are really good :) My boys brought them to school for lunch today. Wah enak banget nih,,,,Looks yummy anything with puff pastry,I'm a fan,krn ku suka makanan yg crunchy,Thanks for get well wishes,i feel better now !! super tempting filling n lovely puffs!! This looks really delicious! Interesting combo! You are very creative and I love seeing the variety on you blog! !And the photos are amazingly beautiful! Thanks for sharing! 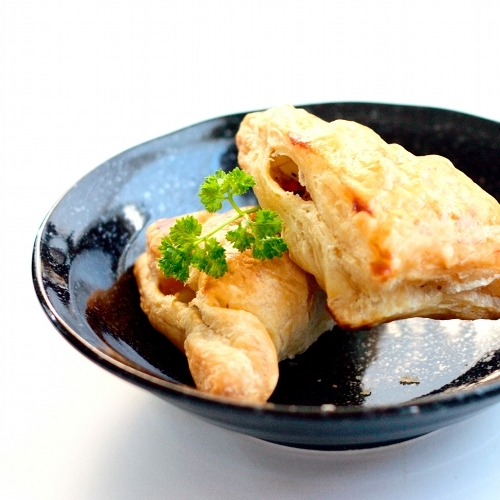 What a cool idea~ I've never had savory turnovers, I think, but how could you resist tuna and potatoes :) Lovely! these look wonderful. I love this idea. cheers thanks for sharing! What a great way to use canned tuna! These look so tasteful! I love the presentation! Hope to c u around again!